Alatheia’s main function is to rehabilitate individuals with limb differences through prosthetic fabrication and fitting. Whether amputees are congenital or traumatic, we exist for those who wish to overcome their disability through the aid of prosthetic devices. Although we can supply and fabricate any type of prosthesis – from the very simple to the most technologically advanced, our primary focus is creating highly functional custom-made aesthetic restorations – prostheses that are “true” looking. Alatheia means “truth” in Ancient Greek. We have developed a special “true to life” custom-made prosthetic line that exceeds all others in quality and patient satisfaction. Based on years of clinical experience, we believe that in order for an aesthetic prosthesis to be successful in aiding rehabilitation, it must look as true as possible. Congruent with our belief, we have created the Dermatos® prosthesis and prosthetic skin line. Dermatos® prostheses look extremely “true to life”. Therefore, users of Dermatos® have the ability to interact with their family, friends, business associates, clients, and customers without their amputation or prosthesis being noticed. While hooks or other visually obvious mechanical prosthetic devices are highly functional, our socially orientated society now calls for a realistic alternative. Our prostheses can provide more complete rehabilitation for many prosthesis wearers. Bank tellers, salespeople, lawyers, physicians, actors, entertainers, secretaries, receptionists, hosts, hostesses, and teachers are just a few of the professions where aesthetic restorations allow for optimum rehabilitation. In fact, many amputees that are not employed also desire aesthetic restorations because it enables them to live their life without the rude stares and often-unintentional offensive comments that distract them from their lives. 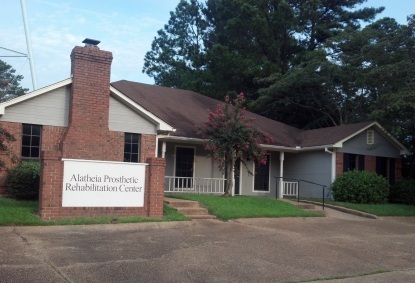 Alatheia’s rehabilitation focus is one of deep psychological and emotional importance, an aspect of rehabilitation that, we believe, has gone primarily unnoticed in the prosthetic community for too long.